If the members of Sanctus Real were boxers, Fight The Tide would be the match that turns them into heavyweight contenders. As the title of the Toledo, Ohio, foursome's album indicates, this is a band that's ready to go the distance. Fight The Tide comes from a line in a song from the band's second album for Sparrow Records, but it contains broader implications about life's ceaseless struggles - against negative, soul-deadening messages from disposable pop culture and spiritual complacency. "Fight The Tide is about maintaining spiritual integrity," says lead vocalist Matt Hammitt. "It's about what we do in the face of struggles, fears and temptations. We have a choice to whether we will throw in our towel and accept defeat, or accept God's strength and do the right thing. Years from now, we want to look back an know that we did the right things." Sanctus Real came out swinging with 2002's Say It Loud, which produced the best first-week sales of any debut rock record Sparrow had ever released. 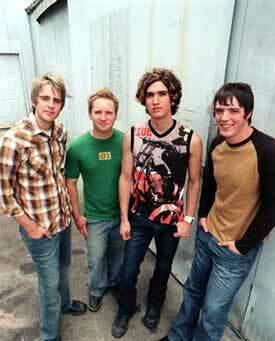 CCM readers voted the band 2003's Best New Artist, ChristianityToday.com made Sanctus Real "a top pick" for '03, and the Gospel Music Association handed the band two Dove Award nominations. A cover of U2's "Beautiful Day" from the In The Name Of Love: Artists United For Africa benefit album gave the group its first No. 1 hit. Say It Loud, like its name suggests, was about making a noise, establishing a presence. If it had been a boxer, it would have been a bare-knuckled brawler, coming out behind a barrage of punches, hoping to land an early K.O. But Sanctus Real displays a newfound savvy on Fight The Tide. It doesn't lack for power, but its blows are more strategically placed, chosen with precision for maximum impact. "We're fighting to take what's been instilled in our hearts and share the truth and joy that we've found without trying to hammer anything over anybody's heads." "Things Like You," with its surprisingly loud acoustic presence, is one of the most challenging songs the band has written. The touching "Say Goodbye" was written as a final farewell from Chris to his great-grandmother, a spiritual leader in his family. "Change Me" came in the wake of the first serious argument Matt and his wife had. "The Fight Song," written by Steve and Matt, has a similar message, one that applies not only to personal relationships but also to petty disputes between believers as well. Songs like the first single "Everything About You," "Alone," and "Closer," with their incisive lyrics and meaty guitar hooks, sport a perfectly matched balance of brains 'n' brawn. Some songs, like "Message" and "Deeds," make direct biblical and religious references. Others aren't quite so obvious, and the band members disciplined themselves to avoid turning familiar spiritual metaphors into cliches. Instead, they came up with original ways of expressing their ideas.